The word fearfully means your uniqueness was designed so well it could produce fear or reverence or awe. Think about this. Think about a time when you saw something so amazing that it scared you. I think of times when I’ve been on a wild ocean, or rafting in white water through the Grand Canyon, or on looking over the edge at the top of Half Dome, or being caught in a blinding snow storm…So what this word “fearfully” means is that you were made in such a way that it should inspire awe and wonder. The point is, when you choose to blend in, you are robbing us from the wonder and awe we would get from seeing a unique you. Imagine the Mona Lisa being put in a closet forever because she didn’t have the same smile as everyone else. Or like a Beethoven Symphony being thrown away because there was too much passion in it. 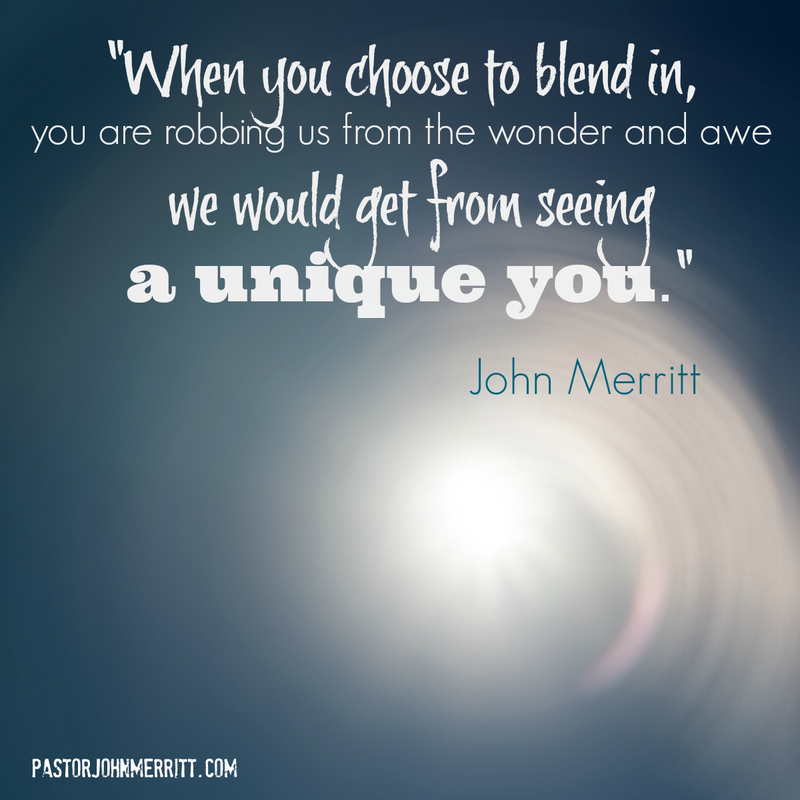 The truth is that when you to try to blend in, trying to be someone you’re not, that is far weirder than to be who God created you to be. The bigger tragedy of losing who you truly are is that your heart starts to feel numb, and your life feels less and less alive because you’ve buried the uniqueness that God made you to be—and that is a soul-killer. So, if I may do a little digging around, even a little prying into your soul—what do you think you’ve buried in terms of the amazing person that you are? What talents, desires, dreams, passions, interests or pursuits have you given up on because someone discouraged you, or said you couldn’t do that, or be that? Or how have you decided that conforming and blending in is better than being true to your unique God-fashioned self? For Reflection: In what way has your passion for life been reduced to a mundane routine of conformity that you hate more than you love? What needs to be dug up, woken from its slumber, and come alive in you again? This entry was posted in Devotion, Encouragement by Pastor John Merritt. Bookmark the permalink.